There is so much to love about grilled pineapple. It can be an interesting side for grilled seafood or pork, makes breakfast more fun, or it can be the star of a fabulous dessert. 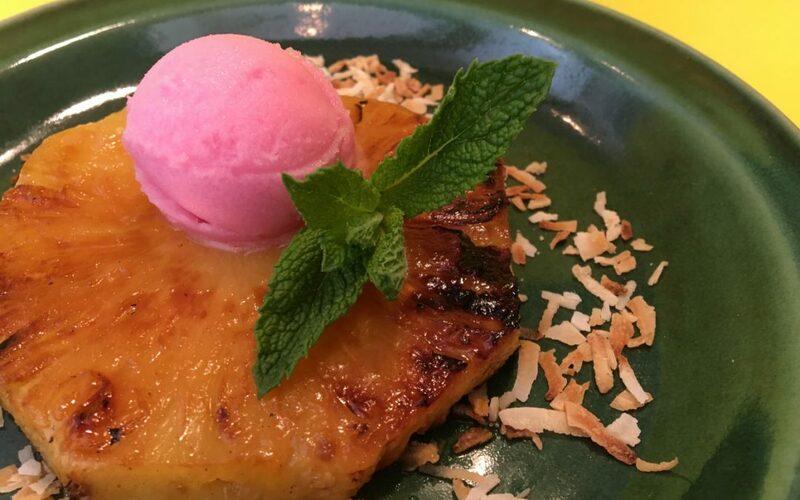 Pineapple has a natural sweetness that is enhanced by grilling; and it looks beautiful topped with coconut milk ice-cream and sprinkled with toasted coconut and almonds. This is a dessert that can be elegant after a fancy dinner or casual at a cookout — it is perfect anytime. Fresh pineapple is rich in bromelain, which is an enzyme that aids in digestion and reducing inflammation. Bromelain’s anti-inflammatory properties are best maximized by eating pineapple by itself, so don’t overload the toppings. Pineapple is also an excellent source of the trace mineral manganese, Vitamin C, Vitamin B1, Vitamin B6, copper, magnesium and fiber. There is so much to love about grilled pineapple. It can be an interesting side for grilled seafood or pork, makes breakfast more fun, or it can be the star of a fabulous dessert. Cut top and bottom off of pineapple, remove skin and slice crosswise into 6 1” rings. Grill pineapple in batches cooking rings 2-3 minutes a side until grill marks are nicely browned, or pineapple slices are golden. 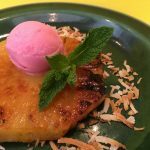 Put 1 grilled pineapple ring on each plate and top with a scoop of coconut milk vanilla ice cream and a sprinkle of toasted coconut and toasted almond slivers. You can vary this easy recipe by adding different toppings like cocoa nibs or whipped coconut cream. In the summer I switch things up and top with a mango or lemon sorbet and add fresh berries and mint. Pineapple’s firm texture hold up well to grilling, but peaches and plums are equally delicious grilled.